I'm back with a brief post... I've tightened the security settings on my Comments in hopes that I won't be getting so many messages like the one you see here. I'm still alive, closing out the last few days at my current job. 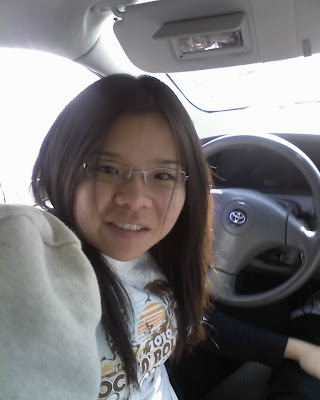 I also got approval from two senior vice-presidents at my company to run my dissertation study once I'm ready. Great to get my name out there for when I make it... big! I had a great Christmas and made out with some really cool loot from my sisters (you may be hearing about them in future posts). We celebrated my younger sister's 20th birthday, and tonight, I will be off to celebrate my best friend's 25th. I know that 2010 will be another busy year, so I'm trying my best to relax as much as possible and enjoy these last few days of '09. 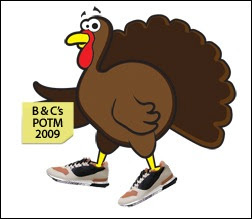 Run to Finish is hosting the Holiday Bootie Buster Challenge again, and this time it's running from November 23 to January 8. This is a good way to keep me motivated (besides the Pile on the Miles-POTM) during what seems like already a stressful time. And prize eligibility is a plus! Basically, I must keep track of points. Again, I will be tracking my activities below. I gave Vapur water bottles to a bunch of people for Christmas, because I kept feeling so untrendy still drinking out of a plastic water bottle. I'm sure you've heard about the energy costs to make/ship water bottles, in addition to potentially dangerous chemicals contained by them. I never took heed to any of that, but I thought I'd at least try something new. Either way, I am a huge water-bottle user, so even if I can just have a convenient water bottle like Vapur, a new habit might be worth undertaking. 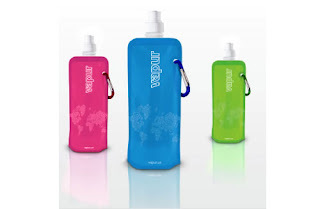 The "bottles" are flexible and basically come flat. When filled with water, it expands to a point where it is able to stand on its own. It holds about the same amount as a normal bottle but stands slightly taller than them. It comes with a sport-type (aka, squirty) cap. It claims to be easy to keep clean and able to be rolled up upon completion. It even comes with a belt-loop clip. These functions seem to work for me, though it will take a while to see if I will get used to this in my purse. Obviously, I will not take it to the park on my runs, but at my desk at work, going out, and even on the treadmill, I can see myself using this bottle. I'm sure I will get many curious questions about it, and I'll be happy to share the info about it and its cause. Above: I'm spending a bit of today and tomorrow working on my dissertation and e-learning stuff for my second job. Don't get me wrong -- I still did my daily gym-time, but the theme of today and tomorrow should be... productivity. So the question is here... do these glasses make me look smart? Why do people get that impression even when I'm not wearing them? I'd rather be known as athletic, just to move away from my abysmal geekiness of yore. 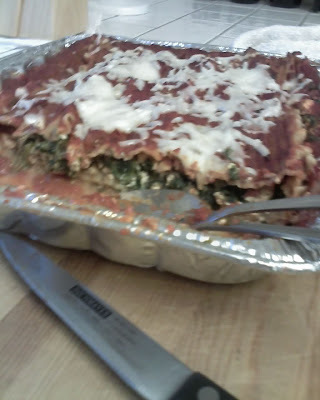 Above: A vegan spinach lasagna is currently sitting in "The Ukrainian's" oven. Well, I lied. The one in this picture, which I made in October, is vegan and was miiiggghty delicious, mind you. However, this time I put ground turkey meat in half of it to make it more man-friendly. 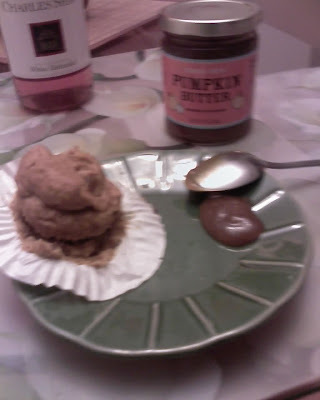 Above: Last month, I also made some pumpkin-ginger muffins, which we ate with pumpkin butter from Trader Joe's. This stuff is WAY sweeter than apple butter and is a great, great holiday treat. Anyone who knows me know that I am a sucker for pumpkin things! 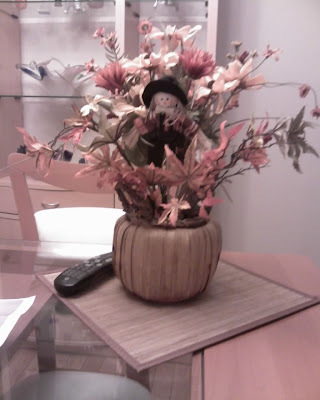 Above: I also spent some time decorating "The Ukrainian's" house for the Fall. I've fallen behind on the wagon with the Christmas decor, so I think the next change-up will be winter, once I have paid my tuition and am out of dire monetary shortage. Above: Jerry's Dogs salad. I went during a carbo-loading period thanks to my co-workers, Chris and Randy (I'll miss you two!). Yes, this wood-fired wiener place offers a salad (for relatively cheap!) and will top it with whatever they would normally place on a hot dog. 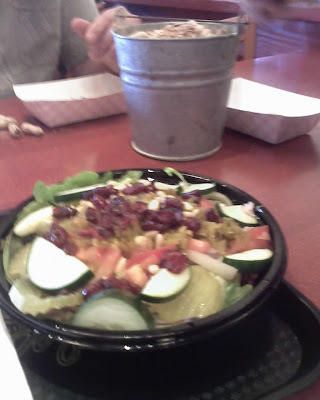 This includes grilled onions, red onions, pickles, Italian dressing, cranberries, cucumbers, tomatoes, and PINE NUTS. I only finished half, but this was after hawking off some fries from my co-worker. Oh yes, and they give you a pail of peanuts to munch on while waiting. I only had one. Above: Finally, here are some crackers that came from home. 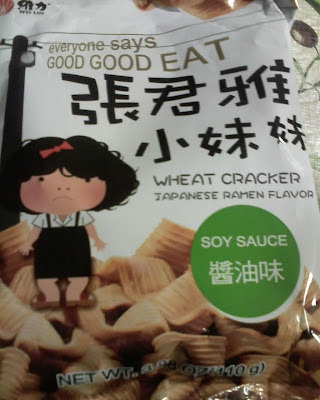 Who wouldn't want to eat such cheery snacks? 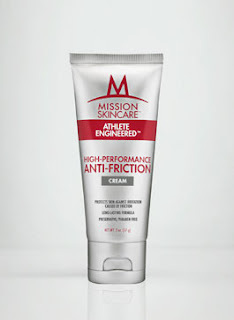 I was really skeptical of the effectiveness of this cream when I used it the morning of my recent marathon. It was a sample that was included in our race packets at the Expo. Gotta love the depiction, huh? Basically, this stuff went under my arms and between my upper thighs. Surprisingly, I still had some leftover in the small packet. I caught "The Ukrainian" using the rest of it, which I had left on the bathroom counter, in addition to his. The end result? For the first time ever, no post-marathon chafe-pain! This could be due to the vast amount of clothing I was wearing, or the fact that I probably wasn't as sweat-drenched as usual, but "The Ukrainian" reported that he didn't chafe on his ankle (from his shoes rubbing against it). So the verdict between the two of us is that this stuff is effective! See the link below for more information. A nice-sized bottle (and I seem to not use much at a time) runs for $12.95. RunningLaur is hosting another virtual race! 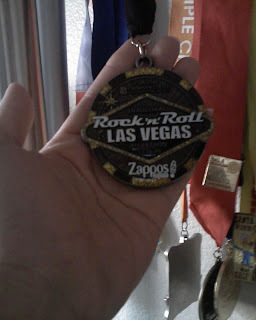 To see other virtual races, click here to see everything I've tagged as a "pseudo race report." When I first saw this, I was thinking, Okay, one mile? That will be cake, and I can bust out many of these. But then I realized that I will be at Mammoth Mountain on this day. Due to finances and simple lack of will, I am not planning on snowboarding with "The Ukrainian," so while he's out doing that, I was thinking about venturing out for a short (one-mile!) run. I have never, ever run in snow before, and I know this will require extra precaution. I will post my findings (he he) below! On a related note, I don't find winter miserable at all. Summer is my worst enemy. Whereas one can do something about being cold, nothing short of standing in front of a freezer all day can help me feel comfortable during the summer. Sure, there is rain, traffic, and not being able to wear certain things during the winter, but this means I enjoy snuggling in my bed more, which equates to better sleep. I despise being too hot to even sleep! And then on an unrelated note, I pretty much have 8 working days left until I change jobs. I'm very excited to not be waking up at 4:30 anymore, although this really made race days a cinch. =P Oh yes, and yesterday was the last day of school for the semester! I'm going to turn in my final paper soon and will hopefully be free of the school beast (save field hours and dissertation) for more than a month. Yeah!!! So I found myself in Mammoth (temp: 40 during the day) mysteriously feeling bereft of energy, not to mention fearful of the cold and WIND. I spent the huge part of my stay sitting (in the car, of course), working on my dissertation, and eating fries. 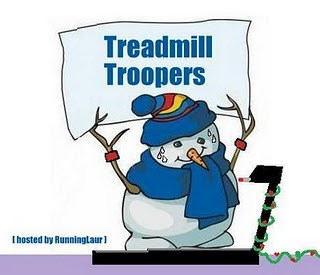 I finally did my run on Tuesday, a day late and on a treadmill (indoor temp: 75?). I had just returned from a holiday luncheon during which I partook in 6 pieces of veggie sushi and a few bites of manga sorbet. So really, a mile seemed like quite a feat. I did it in 9:20. Another half-mile was run before I felt sick from fullness and a weird-smelling guy running near me. Next up was 40 minutes of circuit training, followed by another .5 mile, 3 miles on the bike, 1.1 miles, and another 3 miles on the bike. I still didn't have any appetite until the morning. I'm posting this while I'm still on my post-marathon high! =D While I am excited to resume running, I've just been doing other things and eating a little more than usual. The eating is not intentional, but I think my increased appetite is being caused by a combination of gradual post-race calorie replacement and hormones. Anyway, I don't really own too many Nike things, nor do I typically run in anything but shorts. However, I wore these capris for the first time during my recent marathon and found them not to be a bother at all! I got these at a Nike Factory Outlet store for less than $30. I wish they had black ones (mine is that reddish gray color), but I guess I'm unique now. They were having a 30% sale on top of their already reduced prices. The original cost of the capris (may not be the exact picture -- see me running in them in my race report) was $55. The second worry I had, also dispelled, was that the cut-off part below the knees, as tight as it seemed, would chafe me or cut off my circulation. No such thing happened! The best part is the zip-pocket in the back. I was able to fit my driver's license, hotel room card, and two gels effortlessly. I hardly noticed it while running or walking around. At one point, my hands got too frozen to unzip it, but for normal use, it works wonderfully. I pinned a third one to the left side of the capris and barely noticed it (no sagging) as well. 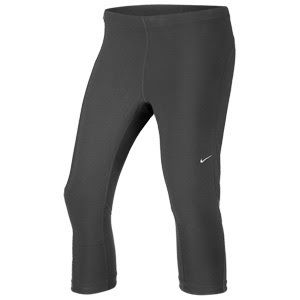 Overall, if I run in cold conditions again (anything below high 40's) -- which I'm sure I will, I at least have these capris to do it in. A So-Cal girl like me is more into shorts! While at the Run/Ex/2009 (Expo) for the Acura Bike Tour, I noticed that this race was being offered at a $15 discount and a free T-shirt for on-the-spot registration (not including the savings of the online reg fee). Upon conferencing with "The Ukrainian," we signed up! We got to Vegas on Friday. It was a party of four with me, "The Ukrainian," M, and Tea Time. I feel like those two days before the race were full of eating, gambling, and resting. It started with holiday pancakes at IHOP. Fortunately, we made a stop at the CA-NV state line to a Nike Factory Outlet store, where I scores some capri tights for less than $30 (review to come later). Then, I had my next meal at the very crowded expo. 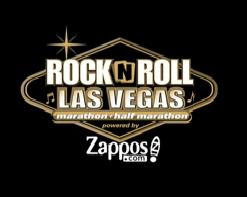 With ~25k runners in this race, you could imagine that staying in the host hotel (Mandalay Bay) was insane! 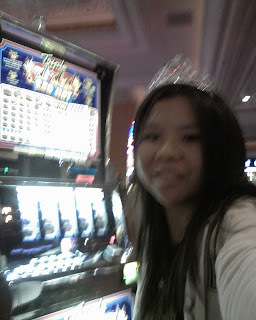 Above: A tiara that I got from the expo + slots = ??? Besides making a crepe run on the strip (La Creperie, Paris), I did not really walk around too much to preserve my legs. I played lots of penny slots but didn't really do too well. The night before, we went to Border Grill, where I simply had a meal of chips and Spanish rice. It was 34 degrees on race morning. 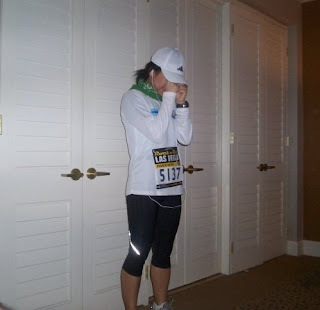 In gloves, two tech shirts, capris, hat, and bandana around my neck, I had never worn so much clothing to race. At 6:15, fireworks were set off in the morning sky. It was great to be able to see the Las Vegas strip without cars! The first miles were flat, until after the half-full marathon split point. I always hate having to go on the "Marathon" side at those! Tea Time got to take the left side, finishing in 1:52. Above: Self-taken on race morning... I don' wanna goooooo! My fingers were freezing, but I was mostly feeling good. I managed for the first time in a month to control my breathing pretty decently, and my ab strain was not really bothering me (probably because it was frozen, lol!). I took my first gel at mile 7, second after 13, and the last at 20. The second half was rather boring with slightly rolling hills. I had been slowly deteriorating, as you can see below, but I was really defeated after mile 20 where my legs were already spent. At mile 25, I could see the finish hotel in the distance, but the short, steep hill they had for us there was enough to break me for good. I could not run for that last mile, no matter how much I wanted to. I managed to squeak out a running finish, but I was disappointed that I was a minute behind my PR. Overall, though, I had a lot of fun over the weekend and even at the race. This was my first out-of-state race/marathon and my last race of the year! Of my now-four marathons, this one was probably the most subjectively easy. I think that in spite of the low energy spell I've had as of late, my week-long carbo-loading helped me run mostly comfortably and for once have a good time. And although I just missed my PR, I proved that last time was not a fluke and that I didn't need "The Ukrainian" to get me to run this sort of time. (Not that I wouldn't run a marathon with him again, but it definitely made me feel like I really have gotten better at this all on my own.) It makes me wonder if I could improve by training better, which I admit to not really doing this time. Either way, I think this marathoning stuff is getting easier with each one I do, and for that, I don't mind my times! Post-finish, I didn't partake in any post-race things and walked allll the way back to our hotel room just in time for the 11 AM checkout. I quickly showered, and the four of us were out of Vegas well before noon to avoid the traffic. I got a leg cramp in the car, but that was to be expected. I think I only had dinner as my only real meal of the day due to all the traveling, but as I said, it was a fun weekend! P.S. Rock n Roll did a great job organizing this race! P.P.S. "The Ukrainian" came in at 3:22. Maybe one day, I can vicariously live out a BQ through him (and score a trip to Boston as well). I am posting many race photos this time, since I was smiling in many of them, for once! That's a testament to how much fun I was having. Unusual! Above: Vanilla Gingerbread - tastes very strongly of yummy gingerbread, perfect for my cold holiday run! I am going to make the transition to GU. They are much more easily found than pretty much any gel out there. 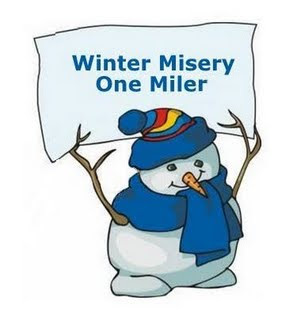 The two blogs N Her Shoes and Healthy Tipping Point are hosting a challenge that is running through most of November called Pile on the Miles. Basically, all miles ran/walked count towards your grand total that will be eligible for prizes! Anyway, feel free to join in on the challenge! I will be tracking my miles below! 11/19 - 7 - ran around neighborhood w/my favorite running partner and was quite speedy! The below will not count... until the next POTM Challenge! 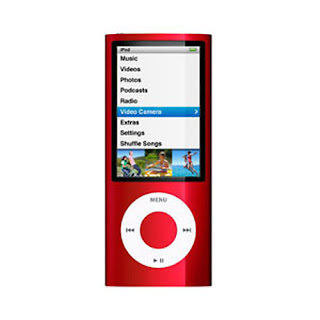 In a very whimsical move, I bought a new iPod nano ($149 retail - but mine was less than this) on Black Friday. Apple was having an uncharacteristic sale, and I decided to jump on it. I know I had wanted a Touch model ($199 retail), but running with it would have damaged it... along with the fact that there's no easy song-changing with that thing. And now, it is currently in transit to my home and will be waiting for me when I get there tonight. So I went with this video-taking device that is about the same size as my current iPod. I don't think I have much use for the video feature, voice recording, or any of that, though. What drew me in was the FM tuner and song-tagging. Imagine... no more me trying desperately to remember the song playing on the radio. Now I can just tag it by pushing a button. Although I wish it had AM radio as well (I am a big fan of KNX 1070/News), I will settle for FM! Another change will be the color. I thought about green again, but for a change, I went with this red version. 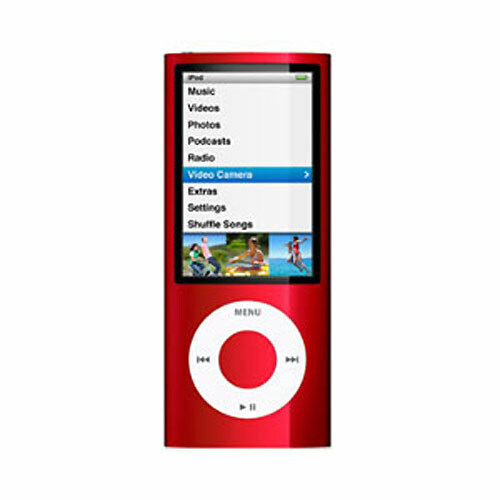 I believe these "red" products go to AIDS foundations. Size-wise, I'm going from 4GB to 8GB. This means that I can put any and all songs I have on here, along with the album art, without worrying about maxing out the space. But as for my current iPod, "The Ukrainian" has taken interest in it and has offered to buy it from me. We have a similar deal on for when I finally get a new, more portable laptop. He has never had an iPod and is in serious need of a new laptop, and given that both of these are still in great condition, I guess I can do this without too much awkwardness (?????). I guess I can consider this a holiday gift to myself, though I got myself some makeup for my birthday this past year and a laptop/iPod/Garmin all within a few weeks for my birthday more than two-and-a-half years ago. Or maybe this is a "new job" gift. Note on "new job": I am finally leaving my job that I despise, effective 1/4/2010. This one in within a 10-mi radius of my house, which will definitely save me commuting time. It will count for my required 1400 field hours for school... which means that I will be doing something in my own field!!! It is a learning analytics group, which means we launch and evaluate training. I'm excited to be doing Human Resources stuff again... and this time, I only have to keep one job and stay (relatively) focused! Also, this is considered a promotion (though not monetarily) because I'm going from the highest intern-level to a level-2 analyst. That's above entry level... my degree has enabled me to do something else besides copying... yay!